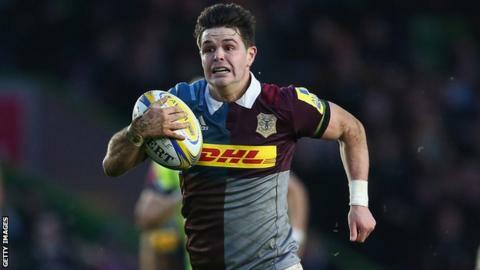 Harlequins held on after a second-half comeback from Sale to register their seventh Premiership win of the season. Tim Swiel and Will Addison traded two early penalties each before Denny Solomona gave the visitors the lead. Charlie Walker's try levelled before Swiel's length-of-the-field score. Byron McGuigan's try got Sale back into it after a third Swiel penalty after the break, but two more Swiel penalties sealed the win despite Solomona's late second try - his fourth in three games. Seventh-placed Quins moved level on points with Leicester, although the Tigers have a game in hand, while Sale are now six clear of 11th-placed Worcester thanks to their losing bonus point. Quins were forced into a late change for England prop Joe Marler and could have gone behind when Solomona, playing just his third Premiership game since his controversial move from rugby league side Castleford, had a try chalked off for a forward pass after a video referral. But he did not have to wait long before going over as he pounced up a loose ball, but Quins hit back with Walker going in under the posts after great play from James Chisholm and Mike Brown before Swiel raced half the length of the field to increase Quins' lead after a spilt kick just before the break. McGuigan's try got Sale within two points, but Addison missed the conversion which would have levelled it as Sale's indiscipline was punished by Swiel before Solomona pounced on a clever kick from TJ Ioane to seal a bonus point and a nervous finish. "The win was a massive positive as we dealt with every challenge with unbelievable tenacity, which shows the togetherness of the team. "Will Collier has broken his ankle and Nick Evans was very frustrated at not being able to return, having failed to pass a head injury assessment. "Joe (Marler) had a problem with a stamp that he picked up against Gloucester and he had another knock on it at Worcester last week. "He didn't train with England in the week but we did a bit yesterday and he began to feel it in the warm-up. "We left it up to him and we erred on the side of caution. It's a strain and he will have a scan but I don't see a problem with him being available for the Six Nations, at this stage." "I'm satisfied with the bonus point as I've come down here before and lost by 50 points. "Our performances in the past two weeks have been much better and if we play like that, we won't lose another game at home this season. "We need to get security in this competition ahead of recruitment for next season but we need to have a bit more control and get the ball to Denny, who certainly knows where the whitewash is." Harlequins: Brown; Yarde, Alofa, Marchant, Walker; Evans, Care (capt), Marler, Buchanan, Collier, Merrick, Matthews, Wallace, Ward, Chisholm. Replacements: Gray, Evans, Sinckler, South, Naoupu, Dickson, Swiel, Hopper. Sale: Haley; McGuigan, Addison, Leota, Solomona; James, Mitchell; Harrison, Webber, Aulika, Evans, Ostrikov, Neild, Ioane, Beaumont (capt). Replacements: Briggs, Flynn, Longbottom, Mills, B Curry, Ioane, Phillips, MacGinty, Charnley.